As a building manager, you have probably heard the terms Green Building and Green Building Certification being thrown around. While it may sound like a buzzword, it’s actually not a new concept. As the Green Building Initiative gains momentum, becoming well-versed in what going green entails and getting your building on board is important. What is a Green Building and Why Does it Matter? There isn’t a hard and fast definition of what a green building is, but in general, a green building is a built environmental space that takes into account its effect on both the environment and the people who occupy the building on a day to day basis. This means that the overall operation, design, and construction of the building will focus heavily on the use of sustainable building materials, high-efficiency energy and water use, reduced waste, and generally minimizing its environmental impact. 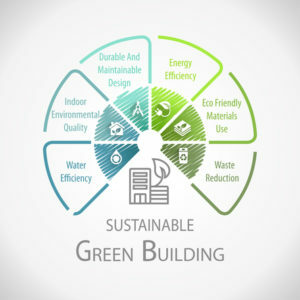 Becoming a green building has many benefits beyond the obvious reduction of environmental impact. Yes, green buildings protect ecosystems, lend a hand in improving air and water quality, and work to conserve our natural resources – but green buildings go beyond that. Reduced operating costs, qualification for tax incentives, improved productivity, occupant comfort, improved health – really, a generally improved quality of life for the occupants. Green Globes Certified? What Does That Mean? The Green Building Initiative is a 501c3 nonprofit organization that provides customized support, training, and certification for green buildings. The Green Globes certification program launched its web-based building design management tool in the U.S. in 2005. This tool is based on a previous, less user-friendly assessment tool called the Building Research Establishment Environmental Assessment Method (BREEAM). GBI is also an ANSI Developer – a contributor to the development of balanced, fair standards for green buildings and improved environmental design. The Green Globes certification program gives you personalized assistance in implementing sustainable operations within your building. They will work with you to identify opportunities for improved sustainability and efficiency. They will also set goals for future Green Globes’ rating system which provides you with a clear, in-depth rating system, covering every detail that goes into the operation of a green building. Why Should I Get My Building Green Globes Certified? Anyone can claim to have a “green building.” An independent, unbiased verification of the buildings energy efficiency and sustainability gives the general public an evidence-based assurance. Following through with the certification process will ensure your buildings’ improved energy and water conservation efforts, responsible use of materials, efficient waste management, and will help you and your team have a full understanding of what true sustainability in building management means. How Do I Get My Building Green Globes Certified? Green Building Initiative offers an easy-to-follow path to certification that includes educational opportunities, advice, and accountability along the way. The Existing Building (EB) certification begins with a user-friendly web-based assessment. You can begin your Green Globes certification by requesting a quote from GBI. There are extensive training materials, PDF guides, checklists, and training manuals available on the GBI website to get you started. After you have completed the assessment, a report will be generated that will assist you in evaluating your next steps to enhancing your buildings’ energy efficiency, reduce maintenance, reduce your general environmental impact, and create corporate-wide goals for improving all these areas. Evaluate what areas are realistic to make improvements on in a reasonable amount of time. Once you have implemented the practices that make the most sense for your building’s situation, a third-party assessment will be performed. An expert Green Globes assessor will make an on-site visit to your facility. The assessor will verify the data that was submitted via the web tool. They will also be able to provide you with recommendations on how to streamline operations and offer guidance on where future sustainability improvements could make the most impact when new funding becomes available. Energy – How energy efficient is the building? What is the CO2 impact? How well is energy managed? Water – Are conservation efforts in place? How is water treated as it leaves the facility? Resources – Are recycling and waste reduction efforts being made? Emissions – What sort of emissions impact does the building make? Are boiler emissions and hazardous materials handled in environmentally conscious ways? Indoor Environment – What is the indoor air quality? Is the noise well-managed? Is the lighting both high-efficiency and well-suited to the occupants’ needs? Environmental Management – What sort of Environmental Management System documentation is in place? Are environmental impacts taken into consideration when making purchasing decisions? What is the general environmental awareness level of the facilities management staff? Your final report will contain your Green Globes score and rating. If your building scores over the minimum 35% overall, you’re certified! How Can ServiceMaster Help Your Building Go Green? At ServiceMaster, we’re proud to report that our proprietary Capture and Removal Cleaning method is an environmentally friendly and extremely effective approach that will get your facility clean! We utilize special microfiber towels and dust wands that are specifically created to collect more dirt as well as high-filtration vacuum cleaners that can capture and contain 99% of particulate matter. Additionally, we only use cleaning products that are certified “green” by Green Seal and Environmental Choice. Are you ready to take the necessary steps to create a green environment in your building? Click here or call (540) 605-9955 to learn more today! In-House vs. Outsourcing—Which Option Is Best for Your Facility?